I love how innovative the names of Filipino restaurants are. 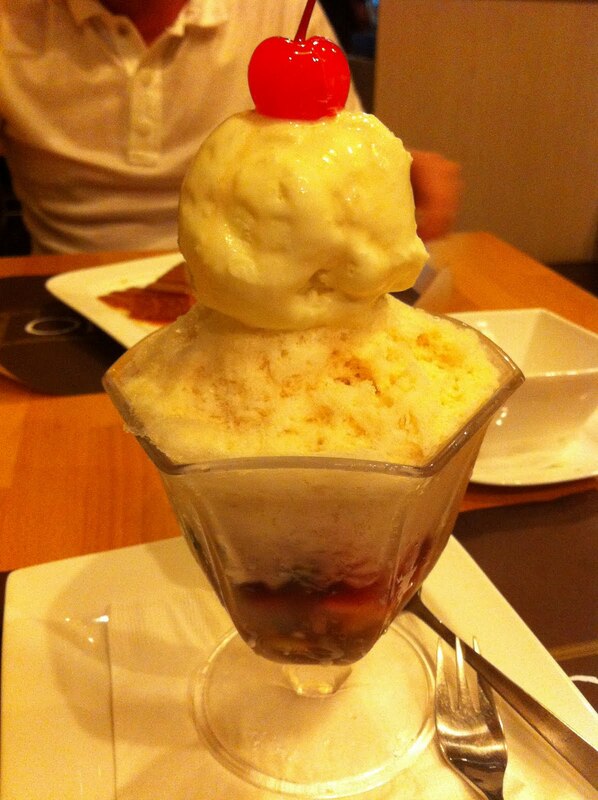 The one I went to previously is called 7107 flavours because of the number of islands in Philippines. Bonifacto is the revolutionary hero for Philippines’s independence. Pork Sisig, which is pork belly/lard on a hotplate, was crispy and delicious! Tasted very similar to fried carrot cake. 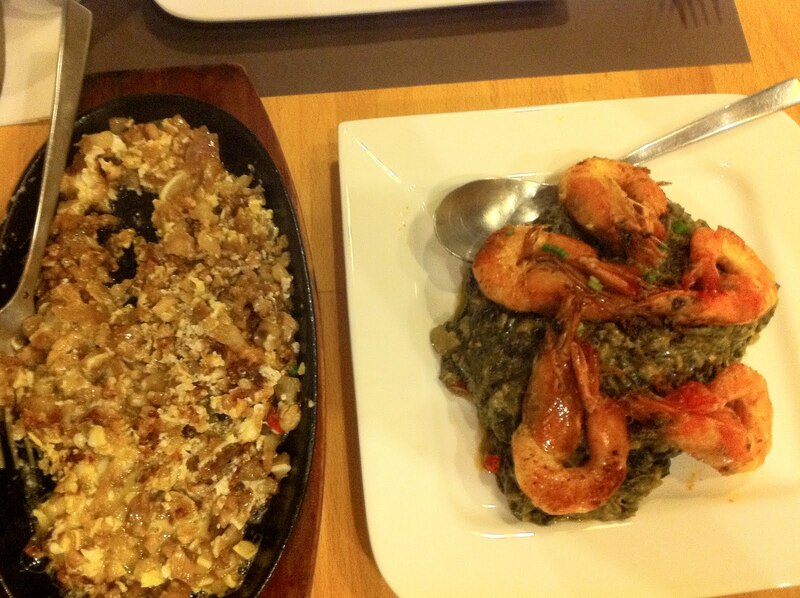 The dish of the day is Pugad Laing, taro leaves braised in coconut milk with bits of lard topped with garlic prawns. Personally, I think the prawns are a lousy excuse to up the price of the dish because the main star here is the vegetables. This is probably one of the few vegetables dishes to give you a heart attack – but ooh so worth the heart bypass operation. The leaves were so soggy in sweet and creamy coconut milk – and then suddenly, the crunch of lard broke the monotony of just vegetables. WIN. 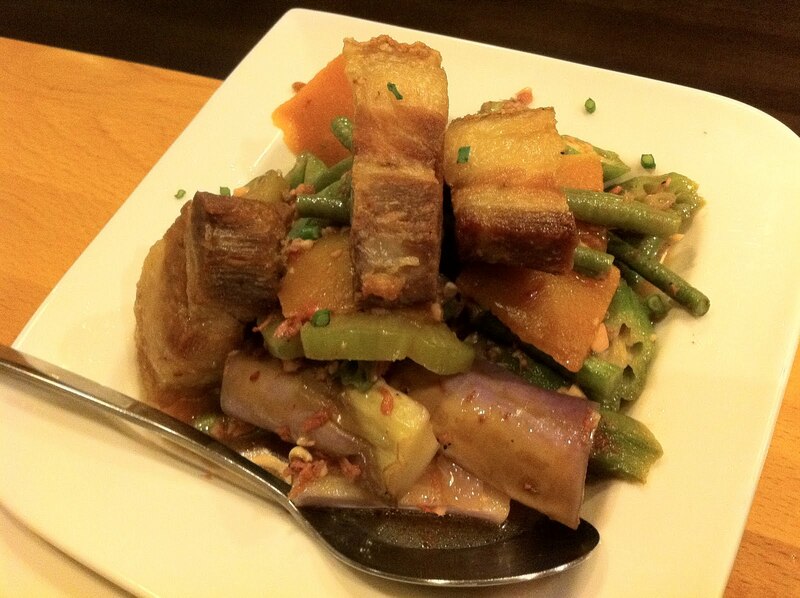 I regretted ordering Oh My Gulay! I ordered it because the name was so cool, comes with an exclamation mark!!! I bet “Oh My Gulay” is what Pinoy pornstars scream out as they climax. But the dish was disappointing, the eggplant, lady fingers, string beans, etc were too hard and bland, and even the pork belly was hard and tasteless. There was a choice of four kinds of rice: plain, garlic, adobo, and bagoong. I made it a point to ask what adobo and bagoong were because I have responsibility on this blog – but I forgot. Sorry. Being adventurous, although the waitress recommended plain rice, I ordered adobo, since they are all the same price. I don’t think the rice would make a difference. Tasted ordinary. I had the Boni Halo-Halo which is basically all their desserts mixed in one bowl: there were sweetened banana, macapuno string (a nut-fruit that looks like coconut, but sweeter), nata and beans, milk sorbet, leche flan (caramel custard), ube halaya (purple yam) and ice cream. That is a whole lot of desserts all in one! BUT unfortunately, it tasted terrible. All the sweetness neutralized one another so there wasn’t a distinct taste, and the bananas were hard–well, I like hard BANANAS but not hard bananas. 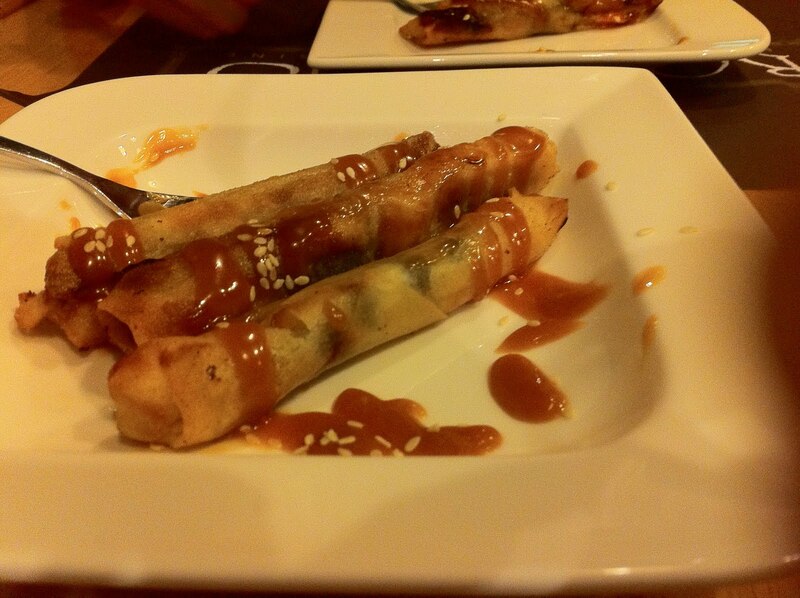 It’s fried popiah with banana stuffing and caramel sauce on top. This is the bomb! Finally, a good Filipino dessert. 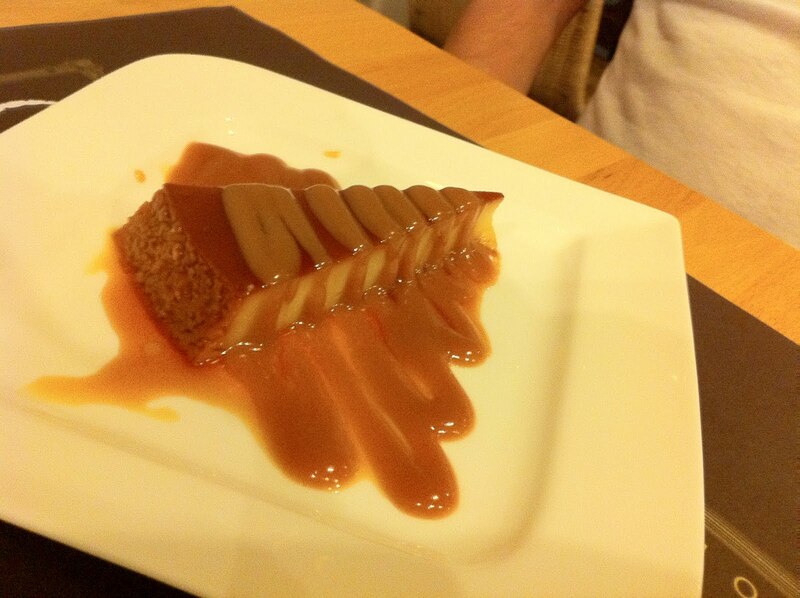 It was crispy without being oily, warm, the caramel complimented the banana. Very wonderful.